Last year SABC 1's Uzalo broke viewership records when it reached 10.2 million views making it the most watched television soapie in South Africa. Furthermore, the soapie has managed to maintain its top position on the viewership ratings up to date. 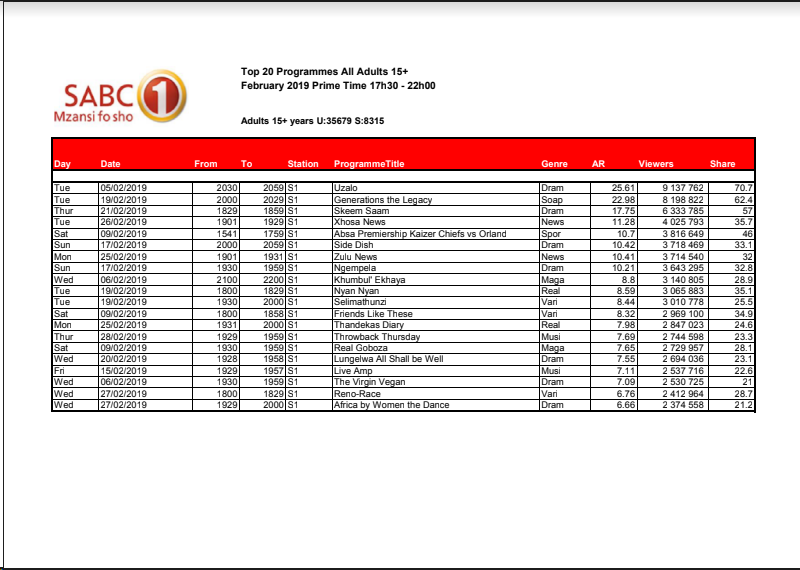 According to current viewership statistics for SA soaps produced by The Broadcast Research Council of South Africa, Uzalo is the most watched film with 9 137 762 viewers by 28 February 2019 followed by Generations The legacy with 8 198 822 viewers. Other Soapies that also have a large number of viewers include SABC 2 drama Muvhango that has over 6 million viewers, Skeem Saam with 6million viewers, ETV Scandal with more than 5 million views and Imbewu The Seed with more than 4 million views. Isidingo The Need was amongst the least viewed soapies with 821 676 views. However, some of these most watched soapies have come across a lot of difficulties in the past. Last year Uzalo's actors and crew had to down tools after SABC failed to pay for the production. However, there was light at the end of the tunnel as the show returned on the screens within a week after SABC settled the payments. A few years ago Generations The Legacy producer, Mfundi Vundla fired 16 actors after they requested an increase in their salaries and several other productions have been writing off characters in order to cut down on salary costs. Zolisa Xaluva also told Trending SA recently that actors and actresses of television productions were earning next to nothing because part of their salaries is taxed by 25%. Acting agencies also request at least 10 % from their salary yet they are not paid for their repeated work that is 25 years or more. "One thing that hurts me the most is the tax issue, you get taxed 25%of the fee you get on a production which is a very painful amount of money to take away from an individual and considering the fact that we don't work that much and there are periods of time when you are off the screens, sometimes you are on screen but you have already finished the money that you were paid . If they repeat your work 25 years later, you don't get paid for it," he said.